Ritual, routine and repetition are the magic words for health and harmony in the home. Learn how to bring these to your daily, weekly and seasonal life with your family. Study in depth the creation of family seasonal festivals. We know how deeply nutrition affects healthy brain development, and yet have we ever considered that each aspect of the young child’s life is also ‘nutritional”? Because the young child is at-one with their environment, they absorb the totality of their environment at the most profound level, in a way similar to the digestive system which absorbs everything that is taken-in. We will take an in-depth look at the development of the brain, beginning in pregnancy, and extending through childhood. Come learn the fundamentals of healthy brain development, and how to create home environments that promote the fullest whole-brain development. Research shows three ingredients are essential to set the strongest possible foundation for your child’s future: a broad palette of sensory experience, emotionally informed movement responses to this sense information, and an attentive adult. We will study each one of these areas in-depth, and learn how to give your child their best step toward the future, and more: Explore the world of the senses and how to “educate the senses”. Begin to know the essential place of movement in the life of the young child and how to offer a wealth of healthy movement opportunities. Develop the courage to be the parent you want to be through self observation, and an incisive understanding of the role of imitation. Play is not only the heart of childhood, retaining a playful approach to life keeps us young even into old age. This essential drive toward play, which is intrinsic to every healthy child, has ancient roots shared by all mammals. As play becomes endangered by our frenetic pace of life, our highly technological society, by the push-down of academics into kindergarten and pre-kindergarten programs, and by the ubiquity of the media for children, parents are becoming aware that something essential is missing. But parents are not alone. Psychologists, sociologists, the justice system, and religious leaders question “what is happening to our children”? Scientists have begun to study the purpose of Play in health, intelligence, social adjustment, emotional balance and creative thought. Join us to learn the importance of Play in your child’s life, how to create wholesome, sensory-rich play environments both indoors and out and how to encourage Play as well as a playful approach to life. Learn to create hand-made toys as well! Studies have shown that the core needs of people in every culture are the need to know who we are and what we can become (identity), the need for knowledge (inquiry) and the need for respect and love (interaction). * All of these needs can be met within the context of an ancient human activity: story-telling, and the artistic endeavors which describe the human story. With the narrowing of school curriculums, with arts funding being re-allocated to computer labs, and the Standards of Learning looming large, parents must augment their children’s education. The home is a far more powerful force than our society allows, and we can create homes full of artistic experience and stories of life. Come learn the qualities of developmentally appropriate stories for your children, how to create your own stories, how to approach the arts and more. This topic is comprehensive, overviewing the organic weaving of many aspects of family life including Family Rhythms, Family Work and Play, Children’s artistic Expression and Stories, and Child’s Play. We look at the way each of these facets of family life works in concert with the others to create a living container, a vessel that will carry each member of the family. We also explore Discipline, understanding that discipline begins with a healthy balance of the prior elements. And we will discuss what to do when everything is in order, and your child still misbehaves. We stand on the threshold of a new human consciousness, an awareness of the unity of being that has not been possible before. Yet we know that each new birth entails the death of the old, and we can clearly experience the old forms dying. The news is filled with images of the death throes of an older state of consciousness. Yet, if we only open our eyes, we see new green sprouts of life abounding, like flowers pushing their way through the concrete. 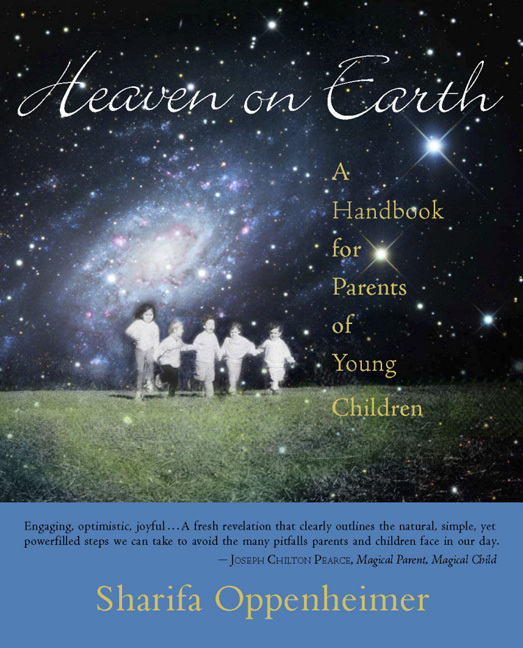 How can parents learn to say yes to the new birth, and also have compassion for and not be frightened by the death we also witness? How do we raise our children for a New that we cannot begin to imagine? Come and explore the unknown, as we together chart a course into a world where the old maps do not go. Come for hope and inspiration. Come for joy. In addition to the study of Anthroposophy and Waldorf pedagogy, Sharifa has studied Sufism and taught meditation classes and seminars both in the US and abroad for 30 years. Through guiding individual retreatants, she began to understand that the principles involved in the shaping of the soul are the same, whether the soul is young or old. In her many years of teaching both young children and adults, she has developed a curriculum for both stages of development that works with these foundational principles. We will look at these principle as they have evolved in the great world traditions, and how they apply in the nitty-gritty of family life. We will learn how to create a modern home consistent with these tried and true principles.